Up to 20 deaths at an NHS-run mental health unit are being investigated as part of a police inquiry, the BBC has learned. It follows fresh investigations into the death of Matthew Leahy, who was found hanged at Linden Centre in 2012. 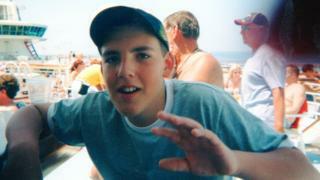 His mother, Melanie Leahy, said her talks with Essex Police suggested the cases had taken place in the last 17 years. The Essex NHS Trust said patient safety was a "top priority". Essex Police told the BBC's Victoria Derbyshire programme it was "conducting initial enquiries into a number of deaths which have occurred at the Linden Centre since 2000". A full investigation may take place later depending on the outcome. Matthew Leahy was admitted to the Linden Centre in Chelmsford in 2012 aged 20, after his mental health problems had spiralled following cannabis use. He also suffered hallucinations. His mother Melanie said staff told her not to go to see her son for the first seven days, to "let him settle on the ward". A week later, she was called by a doctor who informed her that her son had hanged himself. She said he had told her in a text earlier that week he was "in hell". Two years later, an inquest concluded Mr Leahy had been subjected to a series of failings and missed opportunities over a long period of time. "Each patient supposedly has a care plan and it came to light that Matthew had no care plan," Ms Leahy explained. "He had no key worker, no-one knew anything for two days. There wasn't even any observation sheets." Following the inquest, the coroner suggested the trust hold a public inquiry into his death - but the trust said it would take funding away from front-line services. Ms Leahy said Essex Police had confirmed they were "still investigating my son's death but are also looking at... up to 20 patients, all who died by the same means". One nurse, who left the trust in mid-2016 after a decade and wished to remain anonymous, said ligature points - features in a room that can be used to kill oneself - had been identified "many years before" Mr Leahy's death but had not been resolved. "If you asked too many questions you were deemed as a troublemaker and things made difficult for you," he said. The Essex Partnership University NHS Foundation Trust said the history of serious incidents at the Linden Centre was of "great concern". It added it was "improving systems to ensure that investigations are carried out rigorously". During an inspection of the Linden Centre in August 2015 by the regulator, the CQC, inspectors reported that "one patient attempted to strangle themselves with a ligature". A year later they found safety was still a concern. "The trust must ensure that action is taken to remove identified ligature risks," the report said. Last week, an inquest jury found that another patient, Richard Wade, died in May 2015 at the Linden Centre after staff failed to remove a dressing gown cord that he used to take his own life. Patient suicides have also taken place in other areas of the trust. In 2016, Melanie Lowe was admitted to hospital under the care of the trust after her mental health made her increasingly unstable. She took an overdose with pills from her own washbag, and - when admitted to hospital - remained on constant watch. But her observation levels were later downgraded form constant watch to the minimum level required. Ms Lowe took her own life, suffocating herself. At the inquest last November, the coroner heard evidence of a catalogue of mistakes. Lawyer Rachel Codd, representing Ms Lowe's family, said she had tried to abscond twice while on constant watch, but the locum psychiatrist who reassessed her upon admission did not have access to the observation notes. She added: "It seems quite concerning that the trust doesn't seem to be learning from previous mistakes."